In the summertime, I am constantly taking photos of our chickens. Bright green grass and colorful flowers provide such a gorgeous backdrop to all my pictures. And the chickens just look so darn pretty in the middle of a lush summertime landscape! This winter has been so stark that I have struggled with taking my camera out to the coop. The past few weeks I've just felt completely uninspired by the lack of color and freezing temperatures. I really missed snapping shots of my girls and boys, so I was searching for any bit of inspiration when this happened. I noticed the most beautiful light streaming in through the "hay room" where everyone gathered to get a drink and bite to eat early one morning after being let out of the coop. I immediately sprinted back inside the house (careful not to slip on the ice) and grabbed my camera so I could get a couple shots. One of my favorite things about photography is how I've learned to see things differently and take time to notice what I used to just glance over in my haste. Now I am constantly finding beauty in unexpected places and I feel such a rush when I can capture something in a way that makes others see the beauty in it as well. So in the dead of winter I may not have a colorful landscape to inspire me, but now I know that if I just keep my eyes and mind open, the light will always find its way back in. lovely - perfect little flurry of activity in the background, too. Wonderful shots of your chickens, the lighting is perfect. Happy Valentine's Day to you and yours! Have a great weekend! They look as though they are enjoying their get-together! Great job capturing that light! I love that you're looking on the bright side :) It has been a brutal winter and I am very much looking forward to spring coming in hopefully soon! Beautiful light indeed Tammy, and an even more beautiful philosophy! Happy Valentine's! Yes, I have often seen how people take a closer look at things—it seems photography has helped you to see the world differently. I follow a number of people's blogs where they see a story in anything and look close up at things. One of my faves is called florafantastica.blogspot.com wherein Jette (the blog author, from Denmark) takes these pictures of things (flowers, largely) that most people would miss or never look at and sees the world in a marvellous way that we often lose when we are no longer children. Others I have watched this winter have observed the season closely, making beautiful images of the ice and frost; I have so appreciated this being in a place with temps and weather completely dry and very warm (74'f today; 15% humidity). These images and words have inspired me and helped to keep my spirits up by reminding me that there are no 'small' things in this wonderful world. Thanks for being one of those folk. Very nice! I love the light. Isn't it awesome how sometimes the light can create just the perfect photo opportunity at the perfect moment? What a beautiful scene that it created here. You explained this so well Tammy ! and great photos by the way. Yes, it is good light for your chickens. I, too, will drop what I'm doing and grab the camera if I notice the light is just right. I love these pics and agree - you got some amazing shots. It's really cool how the lightening can make all the difference in photos! It has been a dreary winter and inspiration can be difficult to find but I'm happy that you did find some. Loving the photos of your feathered friends but where is Emma. I'm surprised she's nowhere to be seen. :) Hope you'll have a great weekend and Happy Valentines Day to you! Yes! I totally agree.....I feel that I look at things so differently since I've gotten into photography. In 2012 I found your blog at a blog hop, but it is your amazing photos and sweetness that made me keep coming back. I love seeing beauty through your lens. You are right- that light is just right for a pretty shot of the chicks! Great photos, Tammy, I love photos like this, reminds me of when I lived on the Farm. You have a good eye. Have a great weekend. They are beautiful and it's so true about looking at things differently once you start focusing on photography. the feathered friends are very colorful with that light shining thru. You always manage to find the beauty in everything! And, I can't tell you how nice it is to see pictures without a white background! Well these are awesome shots my friend. So glad you saw the light..
Great perspective, Tammy! I feel the same about photography - it helps me to see subtle things that might get passed by unnoticed. This light is looks so warm & happy! I really like that kind of side lighting, it gives photos a whole new feeling. Beautiful! Love the light.....you are so right....since taking photos for my blog I look at things so differently now. Thanks for sharing your beautiful chicks and pics! Your chickens are so beautiful and healthy looking! 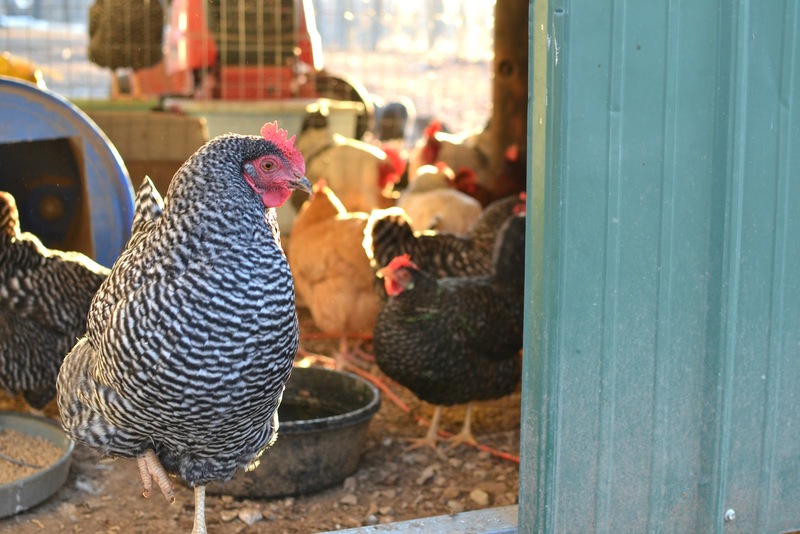 Beautiful pics, looks like your chickens are doing just fine. Sometimes a little bit of late afternoon or early morning light can make all the difference; even if it's for 5 minutes. I often have to struggle with cloudy days in which I only get very little intervals of sunlight; but at least it's something. Our ladies are excited to be walking the run with no snow. It's not pretty though with all the mud. The snow looked better. They just didn't venture very far. Winter's beauty tends to more subtle, I think. When the earth isn't just bursting with life, we look a little closer. Thanks for the reminder. I need to carry my camera more in the winter too. I love this post and I love what Bill said above as well.. It is true that when the earth isn't just bursting with life, we do look a little closer. I was LIKE I LOVE THAT !!!! Yes - the light is so lovely! I agree, light can give an amazing difference. I love winter's afternoon light, when it streams into our house and outside. You always have an "eye" for fun and awesome pictures of your Chicks!! You always have such beautiful pictures and they always seem meaningful too. I love how you said you see things in a new lens and find beauty in unexpected places. I feel the same way since I started blogging. I don't naturally slow down and think, so blogging and sharing with others helps me with those moments. It is always fun to take pictures of chickens! I agree, they look best with green grass and flowers! I love your beautiful hen in the spotlight!